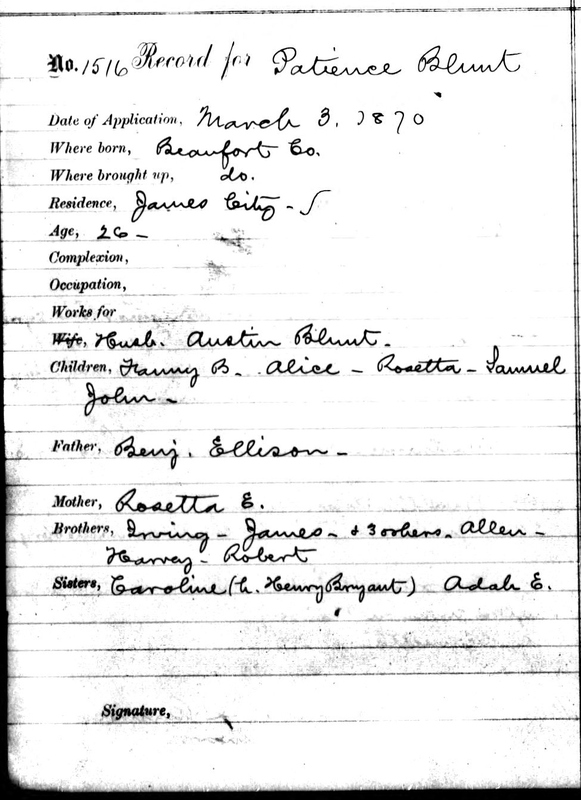 I have to start this post off by saying, I am not the most disciplined genealogist. I am an amateur. I don't always follow through with the one generation at a time approach with my research and yes this has led to some mistakes along the way. Sometimes I feel like some of my searches have been guided by a little help from the other side. A name will get stuck in my head one night and if it still is there in the morning that may become my starting point for following day's research. Well, on a day about two years ago, I decided to do some poking on Ancestry.com regarding my 3rd great grandmother, Caroline Ellison. I had found her previously on each census between 1870--1920. I could not find a death record but at this point I figured she died sometime after 1920. Later, I would find out the exact date, August 1, 1920, when I found a picture of her grave on the Find A Grave website. Anyway, at this time I hadn't really looked into other types of records. The Freedman's Bank records seemed to be a possible place to find additional clues about my ancestor's life. I tried at first a search using her married name, Caroline Bryant and location in Beaufort county. A couple of entries came up this way with her name but no other information. Next I tried looking with her maiden name. Nothing. I tried searching using her husband Henry Bryant's name to see if anything would come up under him. Some entries came up, but none of them appeared to be for my Henry Bryant . Hmmm. On a whim I decided to put in just the last name this time and spelled it as Ellerson and with Beaufort county as the location again. No Caroline but somehow this time something caught my attention on the results screen. 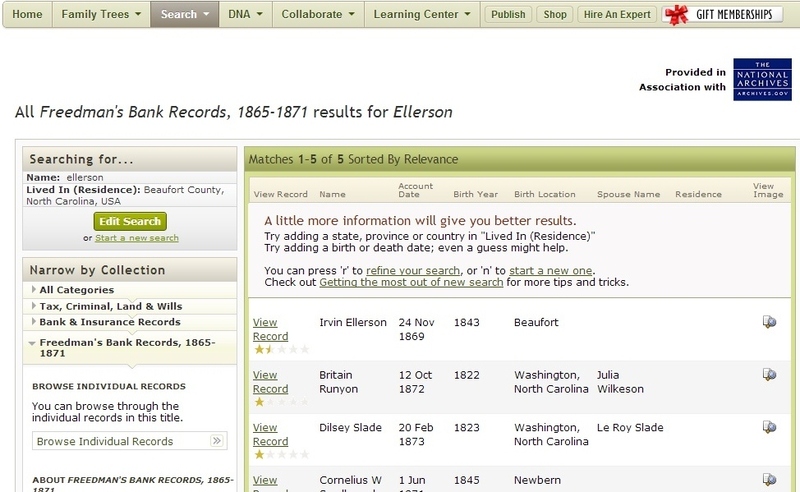 Now in previous searches Irvin Ellison had come up before but I just didn't take notice until this point. When I clicked on this name amazing things started to be revealed. Ancestry.com. Freedman's Bank Records, 1865-1871 [database on-line]. Provo, UT, USA: Ancestry.com Operations Inc, 2005. I said to myself...Say What!! Okay, hold on now. Could this be my Caroline Bryant mentioned here in this record? The age would be about right for her. 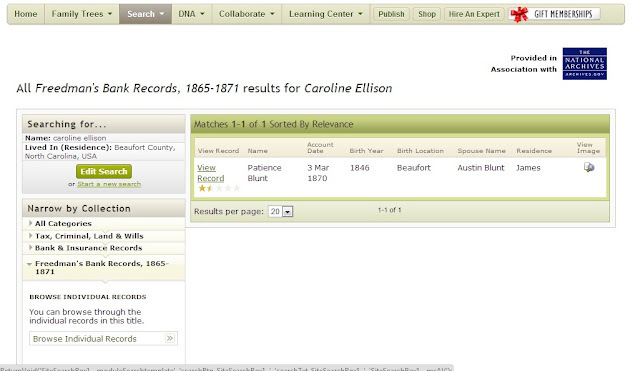 I went back again used the name Caroline Ellison and Beaufort county for search criteria again, realizing now that I probably overlooked something the first go round. I clicked on Patience Blunt this time and there it was the confirmation I was looking for. Sisters, Caroline (h. Henry Bryant) Adah E.
Just like that I learned the names of my 4th great grandparents, Benjamin and Rosetta Ellison and so much more. All this time! I need to start paying closer attention. I've been enjoying so much, I just realized I'm related to and sharing genomes with 4 different Bryants on 23andMe!.......LoL! Hi True! Oh wouldn't that be funny if we are connected through the Bryants. Do you have any Bryants on your family tree and if you do where are they from? Don't you just love t when that happens!! Great research. Congrats! Oops! I accidentally deleted my post and therefore, I am posting it again. Sorry about that! Excellent research work! I know exactly how you feel for I too have been guilty of not taking a second, and sometimes a third and fourth, look at my notes which eventually leads me to the information that I need and more. The more you research, the more thorough you will become -- trust me! Thanks Liv for your comment. This is good to know that I am not the only one guilty of this. Another reminder for myself to keep going back and review the research I've already done. Do you have access to Fold3.com? Irwin Ellerson appears in Company H, 36th Colored Infantry (filed as Irvin Ellerson). Enlisted on 5 June 1863. 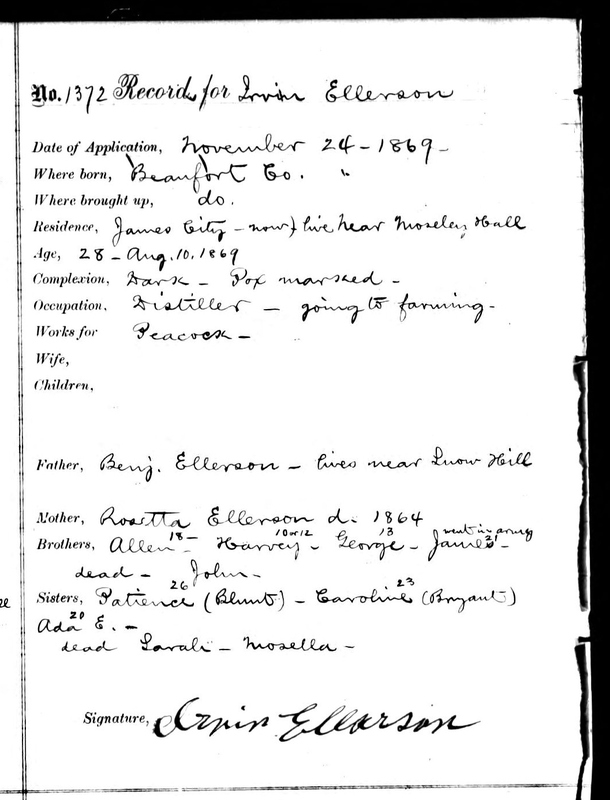 Brother James Ellison was also in the 36th Colored Infantry as a drummer (he was 16). There is also a Joshua Ellison (age 19) in the 36th. All three of them mustered out of service in Texas in 1866. Joshua's file contains his enlistment papers. There is a Civil War pension on file for Joshua Ellison and one for Irwin Ellerson, both from same company. My experience from other pension files is that they are a genealogical gold mine. A little random act of genealogical kindness to start the day. No problem, this looks like a part of a great story. I'm en route to LA, but if you don't have easy access to Fold3, I can email you scans with the info you need for the pension files when I get back. I am planning to go to the Archives during the week of Thanksgiving, and if interested I could add this to my list of files to check. Have a safe trip! I have access to Fold3, thank you again though for the help. You are indeed an angel, only if you happen to have time I would be so appreciative of you adding this to your list of files. Here's my email address akellmurr72@yahoo.com. Let me know about costs so I can reimburse you. This is a great post! The clues all came together to reveal what you have been looking for!! I love it!!! Wow! Sounds like you have had a great time and opened up some doors. Makes me want to go try looking some of my brick walls with variations of spelling again. Hi Kristin, Me too in regards to looking over my other brick walls. I will be busy looking at the Ellisons for now though.